It truly was a great idea. That non-stop dual-sportin' guy Dave Allgood came up with a great ride proposal. 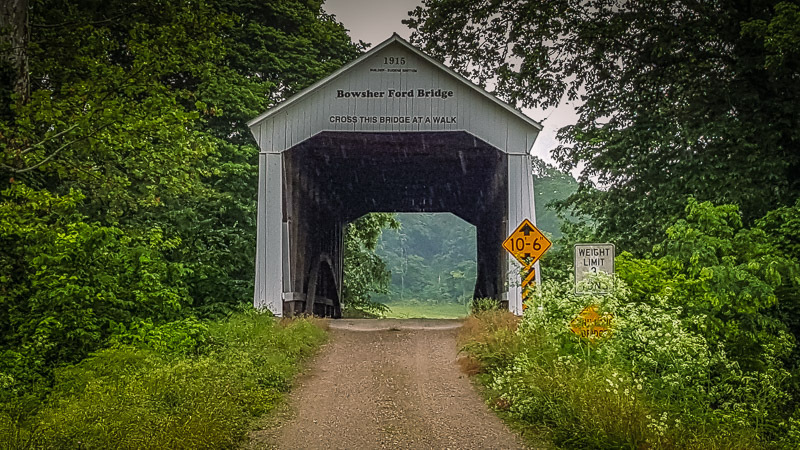 Parke County, Indiana has 31 covered bridges within its borders (click here to visit the Parke County website and info about all the bridges). And these covered bridges are all on lightly traveled, out of the way back roads, many of them gravel. 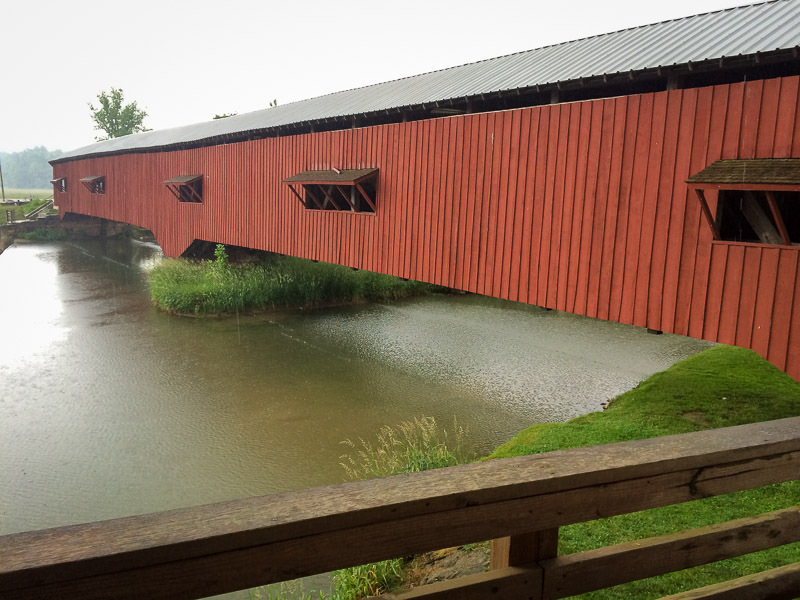 So Dave went to work on the Indiana Covered Bridges Ride. 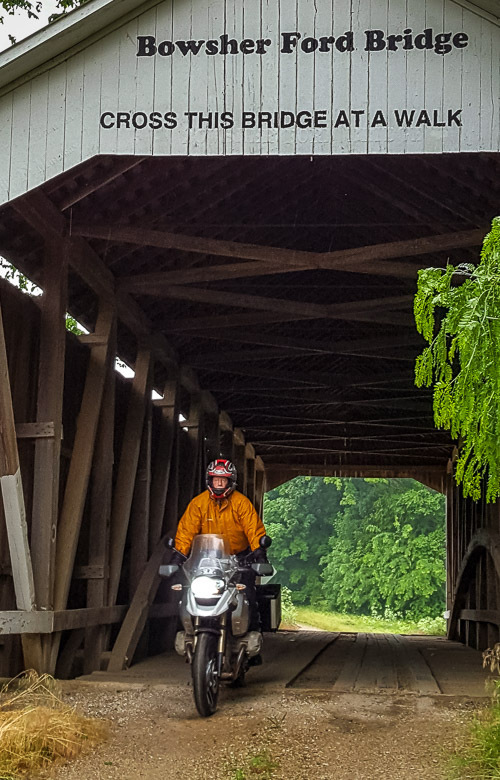 Doing his homework and planning he came up with a 208 mile ride loop that visited 35 covered bridges, mostly in Parke County with a few in adjoining counties, connected by what looked to be entertaining remote roads (thanks for all that work Dave!). Eight TCDers – Dave, Greg, Tom, Eric, Kevin, Steve, Shannon, and yours truly - said "Yeah! Great idea! Let's go do it!" What could go wrong? Really? How about the weather? Seven of us had a great ride down on Friday, taking mostly state highways and county roads. The day was sunny and warm, perfect for unwinding the miles. We arrived at the end of the day in Crawfordsville IN, approximately 40 miles northwest of Indianapolis. There we met Kevin, who'd come down the day before to do some additional riding and an overnight campout. Saturday morning, however, found us with low, leaden skies and the clear threat of rain in the air. Less than half an hour into the ride, before we even made it to the first bridge just 20 miles from our start, it began to rain. And rain it did. Pretty much non-stop for the remainder of the day. There were occasional breaks, but for the most part it was continuous steady light to moderate rain. The group broke into two subgroups. Kevin, Eric and I like to ride a somewhat brisker pace than the others, so we took off on our own following the ride loop on our GPSes. 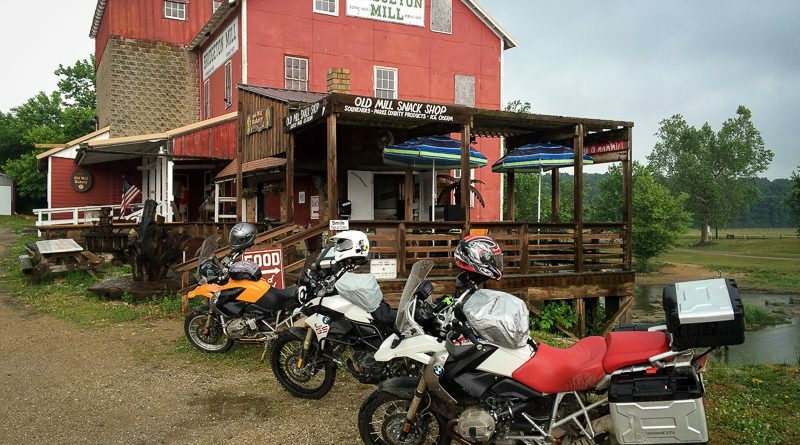 There were several navigational challenges requiring resolution, including a number of road closed detours and one covered bridge that was alleged to be passable and included a ride loop off the main loop. But the three of us worked quickly to look at options and worked our way around all of the obstacles. While we were unable complete the one short side loop because of the bridge closure, we still managed to visit all 17 bridges on the route before stopping for lunch at the eighteenth bridge at Bridgeton. The Bridgeton Mill had food, it was a quarter to one and we were hungry - lunchtime! Turns out Eric and I had excellent pulled pork sandwiches, while Kevin opted for a less satisfactory chili dog. The pulled pork (which was some of the best I've tasted) was on home made buns baked on site, "The best buns in the county!" the proprietor informed us. Who were we to argue that claim? No sooner had we unmounted than the skies opened up and it poured, with the heavy rain streaming straight down. We leisurely ate our lunch while observing the incessant rain, which gave no sign of letting up any time soon. Two hours after arriving at Bridgeton it was still raining. My gear was less than satisfactory in coping with the liquid sunshine onslaught, and as a result I was pretty well soaked. I decided I'd had enough and headed back to Crawfordsville. Eric and Kevin, however, being stout and determined adventurers, decided to continue on. As Kevin noted, "Hey, we were already pretty well soaked. How much wetter were we going to get?" As it turns out we learned later that the other group, having stopped about 25 miles back up the road in Montezuma, decided to bail as well, leaving Eric and Kevin the only ones to complete the ride loop. Waytago guys! Sunday morning found us on the road back home in drier conditions. We wound our way back up through Indiana and into Michigan on a variety of county roads, state highways and a bit of interstate here and there. Despite the very soggy day on Saturday everyone had a great time, with, as always, stories to tell and lies to propagate. It was unfortunate that the all-day rain put a - ummm, damper - on the festivities, but it did not stop this gang from enjoying at least some of a great ride loop over fun roads and lovely rural scenery. Click here to view a map of the ride as ridden by Kevin, Eric and myself.